feet to six inches in diameter. The largest bell, known as the "President's Bell," weighs 5,000 pounds. The original 15 bells were cast in New York. Four were removed when an additional 36 bells (cast in The Netherlands) were installed in 1968. Until 1968 the Campanile contained a historic clock, invented by Charles Fasoldt and exhibited at the Philadelphia Centennial Exposition in 1876. The clock was presented to UNI in 1926 under the terms of Fasoldt's will, which awarded the clock as a gift to the institution that could provide the most attractive setting. 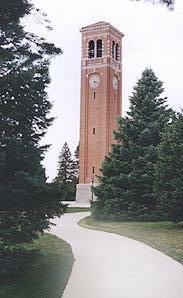 The UNI Campanile was chosen for this honor. The Fasoldt Clock was transferred to the UNI Museum when the Campanile clock was converted to electricity. For more information about the Campanile, contact the UNI Alumni Association at 273-2355. For more information about the carillon instrument, contact the School of Music at 273-2024.